Thunderbird Energetica: When good intentions go wrongI almost feel a little bad writing this post. Because in doing so, I know everything I'm saying is going to come as a big shock to the owners of this company. I know that they think their intentions are pure and their heart is in the right place, and that they think through their own brand of hipster hippy humor they're immune to criticism. I'm pretty sure we've got another Yay Life Tribe or Spirit Hoods on our hands--This is a company that is clearly the heart and soul of the founders, that strives to do good in the world, and is just so earnest in doing so--that they've been blinded to how hurtful their imagery and representations of Native culture are. So Thunderbird Energetica, I'm sorry, but I'm about to tear apart everything you hold dear. And I do feel bad about it. I do. 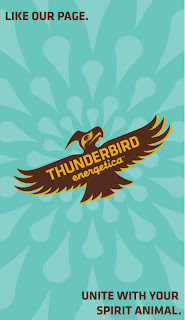 So what is Thunderbird Energetica? It's a small "artisan energy bar company committed to producing powerful sources of human fuel." Every bar is handmade, they use "real" ingredients, and even the wrappers are biodegradable. Cool. I'm on board with that. They also are super into supporting athletes--runners, bikers, triathalon-ers, etc. Also fine. So, if that's where the story stopped, I'd be happy to hop on by my local natural foods store and buy a few bars. But as you can tell from the image at the top of this post, the entire company is imbued with Native cultural appropriation--running so deep that several Native Approps FB readers thought the entire site was a work of satire. Ready? Here's the "origin" of the company:As night fell, a lightning storm looming on the horizon provided the fireworks that further sparked our imaginations. We interpreted this moment as a sign, a metaphor, for what we captured in our energy bar. Raw, organic power and a simple, yet finely balanced force; an entire energy system designed to bring life and romance to an otherwise harsh and punishing environment. We had been touched by the Thunderbird and everything that it represents.Um, right. There's truly too much for me to unpack every layer in one post, so I'm going to send you off to various parts of their website. The profiles of the founders each include a section on their "Spirit Animal"--Catamount, Jaguar, and White-Tail, respectively. You can find these profiles by clicking on "Tribe" at the top of the page, and then "Creators" (not kidding). "Jaguar," also known as Taylor Thunder, the founder listed (until tonight--more on that later) "Native Americans" among his "Inspirations." It now reads something about his dog. Who is named "Lakota," btw.More from the Thunderbird Energetica website:They sell a package where you can "join the tribe" and wear their company branded outfits. It comes with a contract, seen below. Some choice phrases: "Congratulations on your admittance into the Thunderbird Tribe. Your life is going to improve exponentially after donning the sacred colors of the Thunderbird Nation. Be prepared to transcend time and space as you begin a magical journey into manhood/womanhood/tribeshood." They call it a "sacred treaty," but it's supposed to be "funny." Rules include saluting to buffalo and looking for your spirit animal. There's plenty more. They have a whole post about "spirit animals":Thunderbird Energetica is the only energy bar company to harvest the mystical powers of spirit animals during the fabrication and design of our product. Not only do the owners of our company have intimate relationships with their respective spirit animals, but each one of our bars has its own power animal.Intimate relationships? I'd be impressed if the founders had ever been within five miles of an uncaged catamount (puma), jaguar, or white-tail (deer). In response to e-mails, the company founder sent this "apology":Im sorry you interpreted what we are doing as offensive. That is unfortunate. We have nothing but respect and honor for all indigenous tribes and cultures globally. I myself have deep Lakota Sioux roots that I am very proud of! So proud that I chose to start an energy bar company that would reflect that. The way I select to express my freedom of expression and speech is my conscious choice and perhaps it is too light hearted for your taste. Once again, never meant to offend you. Obviously you don't understand my positioning and that is ok... We are all different and due to that diversity we express ourselves differently. You still have to respect that idea and the freedom of creativity. Sent from double rainbow machineTo which Adrienne responded (in part):I get that most of your website is tongue-in-cheek, that it's supposed to be funny, poking fun at a culture of hippy-dippy health food nuts. I understand what you're attempting with your writing, because that hyperbole and exaggeration are rhetorical devices I employ all the time on the blog as well. But the examples I've pulled out above, like the "spirit animals," the fake-Indian-naming, the use of the term "tribe," and the overall co-opting of Native American spirituality are upsetting and hurtful to me and other Native people. First of all, your images and language collapse hundreds and hundreds of distinct tribes and traditions into a generic new-age Native stereotype. We don't all participate in sweat lodge ceremonies, we don't have "spirit animals," very few of us have names that follow the extremely stereotypical "adjective+animal" format. The website perpetuates stereotypes that you may see as "positive"--Native peoples as stewards of the land, connected to nature, mystical, magical, special--but even these stereotypes are harmful because they relegate us to a mystical, fictional creature that exists in the past, not allowing Native people to exist as a modern, heterogeneous population that lives in the same world you do. Taylor, you say that you have "Lakota Sioux roots," and that's great. But if you explored those roots a little more, you would learn that until 1978, American Indians couldn't even legally practice our spirituality that you so openly appropriate--sweat lodges, naming ceremonies, "vision quests"--all illegal. That is why it hurts many of us so deeply when we see these practices being appropriated or mocked. If you wanted to form a company that "reflects" your roots, I'm pretty sure your Lakota elders would not have told you to rely on stereotypes. In particular, it reminds me of the racist Teepee Games website. It's time to get a clue, people. Referring generically to tribes, vision quests, and spirit animals doesn't inoculate you from charges of cultural misappropriation. Nor does claiming you're doing it as an "honor" or a joke. You're still stereotyping Native people as exotic, strange, or otherworldly. For more on the subject, see Why Tonto Matters and Ignorance or Malice? What's an "artisan energy bar"? Can foods less than two decades old really be "artisan"?